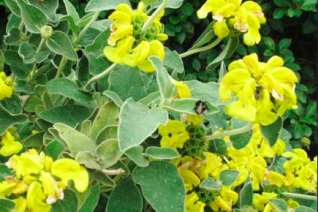 A really handsome and unique form of Jerusalem Sage. The large gray leaves are spongy and quilted and good looking all the time. This woody perennial forms a large spreading plant to 4′ tall and 5′ wide in full sun and rich to average well drained soil. Regular light summer water- to establish then drought adapted. Very drought adapted when established. Blooms June to August in our climate and makes a great paring with smaller low water full sun woody shrubs such as Cistus or Ceanothus. The whorls of soft yellow flowers born on upright stems have the sweet fragrance of cloves in close proximity. A very cool cut flower that lasts for more than a week in a vase. Loses some leaves in winter- gets them back quickly in spring. Wonderful on sunny hillsides. Moderate deer resistance. 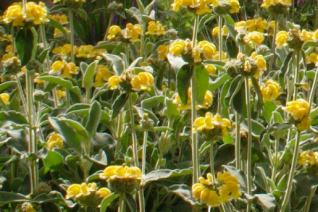 Aka Jerusalem Sage. This is a very compact but floriferous form of this evergreen perennial/subshrub. To 3′ x 5′ and forming a dome of thick gray/green foliage. In summer spikes extend and display yellow flowers in whorls around the stem. Very symmetrical and loved by pollinators. Surprisingly up close it is very fragrant reminding me somewhat of the sweet clovey scent of Dianthus. Long, blooming for 4-6 weeks. Full hot sun and rich to average well drained soil. Ideal on hot slopes. Light summer water aids vigor but it can take very dry conditions once established. Easy to grow, long lived plant. Mix with other hot sun dwellers and other mediterranean natives. Moderate deer resistance. Evergreen. Wow, a species with golden leaves. Not variegation. How cool is that and it is a cool old gold color that the felted thick leaves glow. 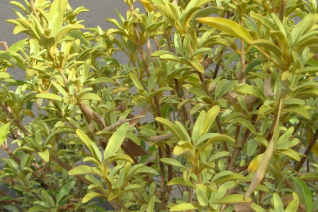 Rounded evergreen shrub to 30″ tall and 3′ wide forming a dome. In summer whorls of large yellow flowers surround the stems and kind of blend in with the foliage. Wonderful year round appearance. A plant I nominate as #1 Hellstrip plant of the year. It thrives in the heat reflected off the asphalt and it requires absolutely no water whatsoever when established. Plant for foliage and the flowers will follow. Glows in the dead of winter. Moderate deer resistance.